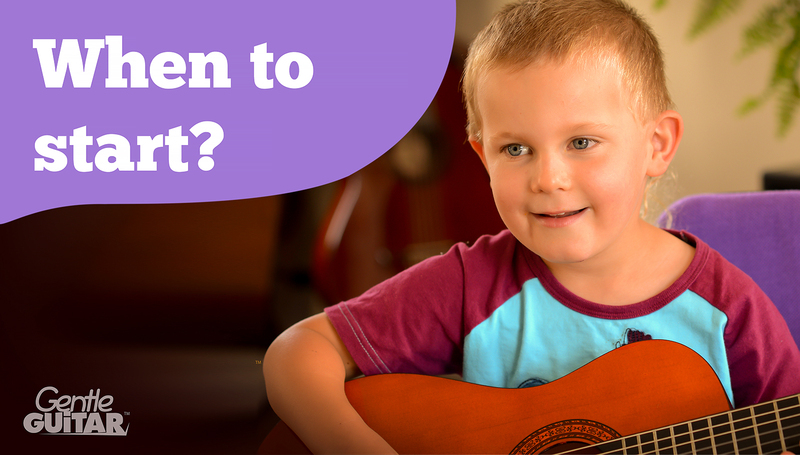 At what age can kids start guitar lessons? There’s a discrepancy among guitar teachers regarding the best age to start lessons. Some say as young as 3, others advise not before 8 or even 10. The majority of guitar teachers are part-time musicians without any teacher-training. Some teachers graduate with bachelors or masters in music but have no experience in pedagogy. Other teachers, like myself, are professional musicians who’ve spent several years under a teacher-training apprenticeship with a master mentor, or attended university for music pedagogy. Training, personality, and experience determines a teacher’s ability and willingness to work with young children. Does the teacher know how to structure a lesson and adjust to the moods of a young child? Does the teacher like working with kids? Does the teacher have lesson plans and teaching materials to engage a young beginner? The decision when to enrol your child should be based upon the teacher’s experience, personality and teaching method and materials. In my experience, the younger kids start to learn music, the better. At Gentle Guitar we teach music literacy (the reading and writing of notes) from the beginning. For this reason the youngest age of our learners is between 5½ and 6. Unlike the majority of guitar teachers, I believe that kids should learn to read and write music from the start. Kids learn to read and write communication symbols in their native language as soon as they are able to. Why shouldn’t they learn to read and write musical symbols as they are beginning to play? It makes sense and it makes learning music easier and faster. At your first Gentle Guitar trial lesson you receive an engaging workbook. 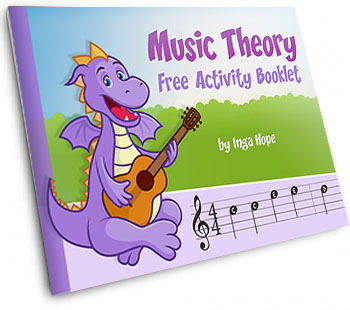 This workbook introduces your child to the fundamentals of music theory and the musical alphabet. You learn about different kinds of notes and their rhythmic values. You clap along together, as your child realises how easy it is to read music notation! The workbook contains word matching, puzzles and basic arithmetic, such as 1+1. The Gentle Guitar workbook is filled with tracing and colouring activities. 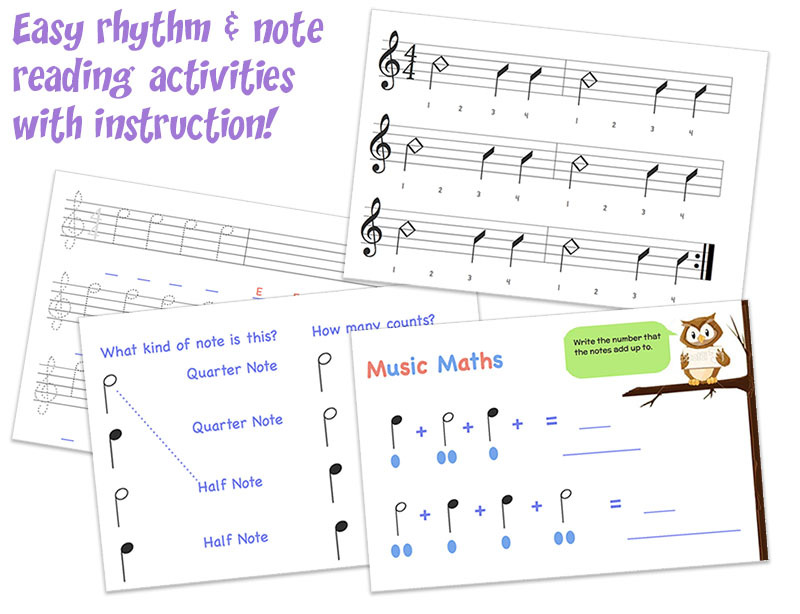 Our specially-designed exercises develop hand-eye coordination and prepare your young learner for plucking, reading and writing their first notes. Imagine a child growing up cut off from human interaction and the human language. If a child is not exposed to language by a certain age, the part of the brain responsible for linguistics doesn’t develop as it should during the formative years. When such a child re-enters society, say after the age of ten, the window of opportunity to learn to speak is lost. It’s therefore not a surprise that young children learn foreign languages faster than adults, and speak them fluently. Music is a complex symbolic system, just like spoken languages. The earlier a child learns the language of music, the faster and easier the benefits of music tuition will spread into his or her daily life. The best time to start guitar lessons? The younger the better, provided that you find an experienced and suitable teacher to guide you and your child. 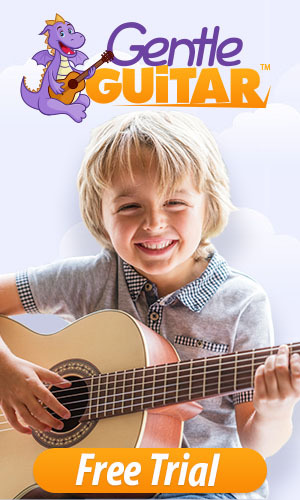 If you are looking for guitar lessons for a young child, read more about our guitar classes for young kids. Academic or Recreational Music Lessons – What’s Best for You? Does the brain structure of kids who learn music differ from those who don’t? What do private guitar lessons cost ? Inga Hope is the author of Gentle Guitar™ method and blog. Inga writes about the benefits of music education and how formal music study enhances brain development & overall development in children. Are you ready to try a free Skype lesson?